This 242 page e-book is a slight revision of the book originally published in 1992. 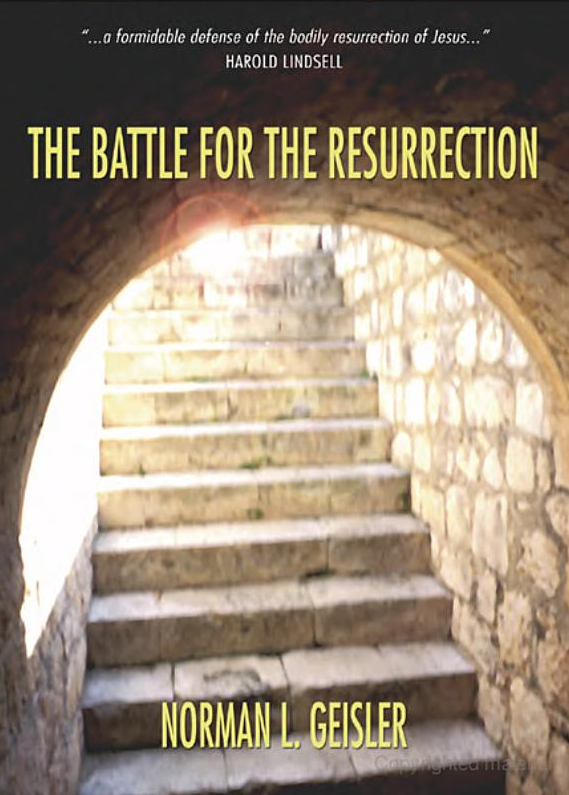 The second edition of this book is available in softcover printed edition at https://wipfandstock.com/the-battle-for-the-resurrection.html and in the Logos format at https://www.logos.com/product/9148/the-battle-for-resurrection. First it was the battle for the Bible; now it is the battle for the resurrection. First the question was whether we can trust what the Bible says about itself; now the question is whether we can trust what the Bible says about the resurrection. First it was whether inspiration covered only spiritual matters but not historical and scientific statements. Now it is whether the resurrection body is only spiritual or whether it is material, and historically and empirically observable. Geisler’s powerful book on the resurrection defends and explains this central doctrine in light of recent debate, controversy, and skepticism. Dr. Geisler fought battles for the orthodox doctrine of the resurrection and corrected the unorthodox views of other evangelical seminary professors. The book that started the controversy was Murray Harris’ Raised Immortal (1985). Norman Geisler wrote The Battle for the Resurrection (1989) in response to Harris’ book. Harris responded with another book, From Grave to Glory ( 1990). In 1993, Geisler published In Defense of the Resurrection as a response to Harris. Since the belief in a purely spiritual resurrection of Christ is prevalent in many cults, those involved in countering the rise and growth of cults would benefit greatly from reading this book. Dr. Geisler’s book is effectively designed as [an] antidote to the misery of turning Christ’s factual resurrection into an event outside the bounds of ordinary history. Geisler demonstrates not only the danger in the theology of various cults but also the tendency to discount the bodily resurrection of the Lord, even among evangelicals. It is essential reading for every pastor and student. The proclamation that Jesus was raised in the same physical body in which he died is just as important today as it was in the first century. The book signals such a call to the importance of this doctrine. KennyKindleOnly-RedoMaybe merge with Defense Rez book.